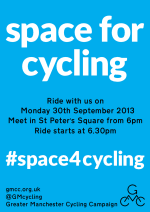 Ride with us to show national and local politicians that people want safe space for cycling. 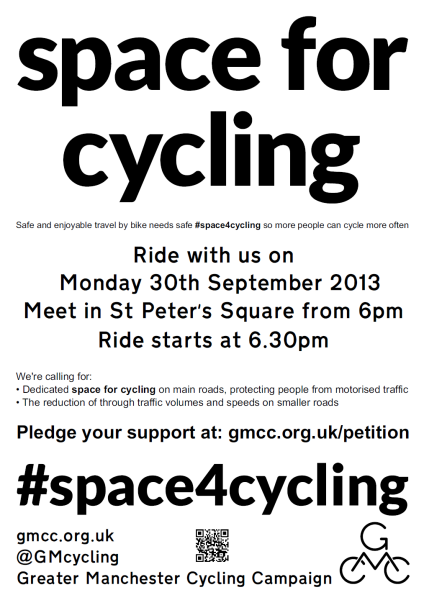 UPDATE 1: Please sign our Space for Cycling petition to add your support, even if you’re riding with us too. 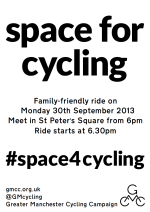 UPDATE 2: Share our facebook event page and tell people you’ll be riding. UPDATE 3: DIY flyers and new posters added below. 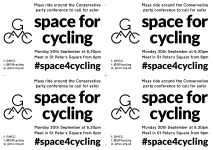 The Conservative party conference is being held in Manchester later this month, so we’re holding a #space4cycling ride on Monday 30th September a 6.30pm. It’s not a party political event, we plan to deliver copies of the same petition to the Conservative party, Manchester City Council and Transport for Greater Manchester. And it’s not a protest; we’re merely riding to raise awareness of the issue. We want the ride to be a fun, family friendly event where we ride as a group at a gentle pace for a short distance around the city centre. The exact route is still TBC, we’re hopeful that the police will approve our proposed route when we meet with them in a couple of days time – please keep everything crossed for us! We’re meeting in St Peter’s Square, M2 3DE, from 6pm and the ride will set off at 6.30pm. There will be plenty of space as Mosley St is closed to motor vehicles during the conference. 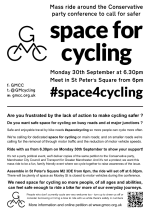 If you think you can help with promoting or marshalling the ride the please email contact@gmcc.org.uk and we’ll get back to you with more info. We’ve created some posters below; please put one up in your staff-room, canteen, noticeboard or anywhere you think suitable. 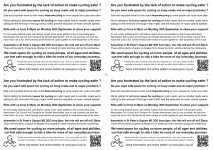 If you’re willing to organise a feeder ride to help people get to the start point then consider writing your name and contact info on the poster to encourage people to ride in with you. We need space for cycling so more people of all ages and abilities can feel safe riding a bike for their everyday journeys – we hope to see you on Monday the 30th. People who don’t currently cycle are very welcome too – just turn up to cheer us off or maybe consider borrowing or hiring a bike to ride with us while there’s safety in numbers. Updated poster with link to petition. Click to download 25KB pdf. 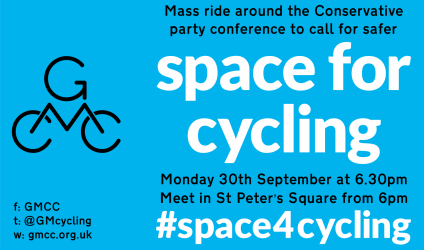 The Space for Cycling campaign (aka #space4cycling) was initiated by London Cycling Campaign who have organised 3 rides so far, all in central London. 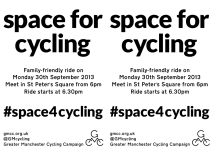 We would like to thank LCC for their encouragement and support for Greater Manchester Cycling Campaign’s first #space4cycling ride on Monday 30th September 2013.